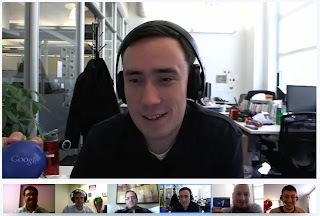 Google+ Hangouts have proven to be a great way to connect people and engage with an audience, something the Google Developer Relations team is very passionate about. In that spirit we’re going to start holding office hours for the AdWords API using Hangouts, the first of which will be on November 16th from 1-2PM EST (10-11AM PST). Unlike our workshop events which have agendas prepared beforehand, these office hours will be entirely focused on your questions and feedback, so please come prepared with any technical or implementation topics you’d like to discuss. With the v201109 release and the reports migration we’re confident there will be plenty to talk about. To join the hangout you’ll need to have a Google+ account (sign up here) and the Google voice and video plugin installed (download available for Windows, Mac, and Linux). Hangouts are currently limited to ten people at a time, so if you aren’t able to join right away please try again later in the hour as a slot may have opened up. Additional information about Hangouts is available in the Google+ Help Center. Let us know you’re planning to attend by clicking the “I’ll be there” button on the developers.google.com page for this event. We’re still deciding how often to hold office hours, so if you’d like to see more of them make sure you show your support by registering and attending. Plans for sessions in Europe and Asia-friendly timezones are also in the works, so stay tuned for more details. We look forward to talking with you face-to-face, but until then you can reach us on the AdWords API forum with any comments or questions.